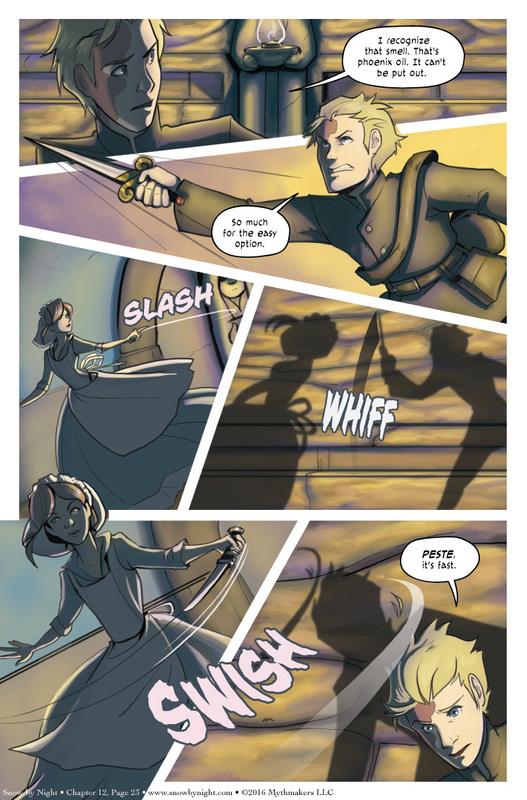 Jassart tries to fight a shadow with with shadow on Chapter 12 Page 23. But Pénélope is fast and gives Jassart a haircut. Maybe she doesn’t like his hair either? Vote to see a preview of the next page. Some convention updates. Snow by Night will be attending at least three conventions this summer — Balticon (a cool literary convention with George RR Martin as a guest), Denver Comic Con (our first trip that far west), and GenCon (my favorite gaming convention). While it’s probably not easy to think in a situation like this, the easiest solution would be to press your back against the wall, so your shadow is behind you. That, or sidestep toward the lantern to make your shadow large enough to cover the opponent’s shadow. …or, as I mentioned last page – Jassart could just throw his jacket over the lamp. Even if Pénélope is able to eventually slice through the covering, we can see there’s plenty of space to hide in the shadow underneath the statue’s arms. He just waits there, and as soon as Pénélope’s shadow appears, reaches out and cuts it in half. Of course, that assumes that the interaction works both ways – and she seems to be avoiding his thrust in panel four, which implies that it does. If this is the case, then it would be even more effective is to step towards the lamp, become huge in comparison to his attacker, and then use the shadow of his massive hand to crush her. But we know that won’t happen because it would be 1) too dark for the tale, and 2) too quick a resolution to the trap. Yes, we can go back and forth about this – if his shadow is many times bigger than Penelope’s, not only would she be able to only reach a narrow range of his middle, but her blade would only be the equivalent of a fraction of an inch long – painful, but hardly fatal. And again, the closer he is to the flame, the greater his relative speed (ie he moves just a step and his shadow clears half the room). I guess my thinking about this is colored by my style as an avid RPGer – it’s a puzzle to be solved, rather than a heroic encounter to be won with panache. The knife’s shadow will retain its sharpness if it gets covered by Jassart’s shadow, I bet. Which means the type of injury sustained depends on where exactly the knife was when Jassart’s shadow moved to cover it. None of the obvious options (chest, leg, groin) seem all that desirable, especially since that knife’s not coming out. So, if they can still hurt each other fighting this way, then… why not just fight face to face? If he got the lamp between them and held the knife right next to it, the projected shadow of the knife would be huge and extremely quick. Plus, the shadow of his body would be at the other end of the room and so big the cuts of the tiny knife would be meaningless. No, the best option would be to get closer to the lamp so his shadow was larger. It would increase his speed and minimize the damage she could do. Wha… Him getting closer to the lamp would increase the size of his shadow, yes. Wouldn’t that just make him a bigger target? Because if he becomes bigger, her knife is (proportionately) smaller. Which would you rather be the one to make the souvenir hole in your arm: a paring knife, or a broadsword? But why, mes amis, is she doing this? To wound him, and capture him until the master came home? All of her behavior has thus far seemed more threatening than that. Surely such a clever mage could have set a trap that would not have required Penelope to stab the intruder, if they only wanted to capture him. But why kill him? I wonder if they want Jas to escape with the mask anyway, but they want him to work to get it. If he steals it and escapes too easily, he might get suspicious of how easy it was and worry that it’s a set up. But if he has to *work* for the prize, he’s less likely to wonder if Cienan secretly *wants* him to have it. If he were to take the lamp and hold it between himself and her shadow, his shadow would perpetually be on the opposite wall from hers. She could never reach his shadow to hurt him!